As it does every year, Activision is stepping up to the plate to represent Call of Duty fans so dedicated that spending merely $60 on a video game does not properly express their love and devotion. A pair of images appearing on NeoGAF in advance of an official announcement demonstrate two ways to pay significantly more for Call of Duty: Black Ops II. Update - Official details and pricing from Activision at the bottom! 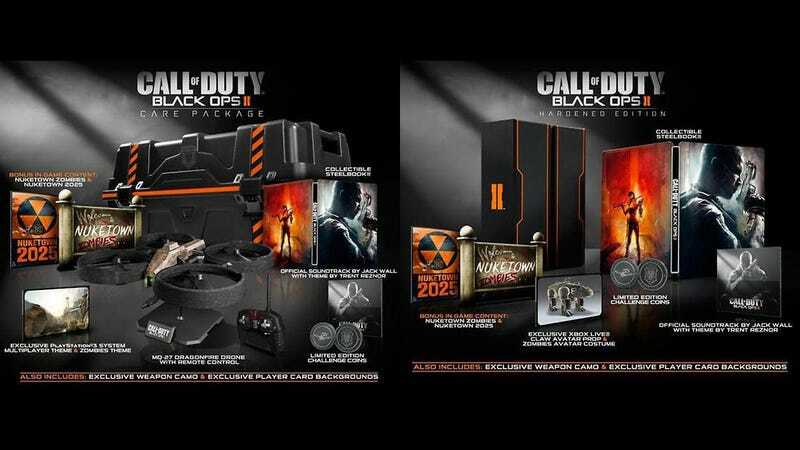 While we patiently await word on how much we'll pay for the Hardened and Care Package editions of Black Ops II, we can at least examine the contents of these limited editions. The Special Care package in particular is intriguing. Packed inside the massive box teased via the <em>Call of Duty Twitter yesterday is your very own hovering attack drone, just waiting for you to figure out a way to weaponize it. And hey, is that a PlayStation 3 theme? Sold? Meanwhile the Hardened Edition features everything the better one does excepting the box and the attack drone. Oh, and an Xbox Live Avatar prop. Woo. As Polygon notes, neither package seems to include Call of Duty Elite access, though both include exclusive weapon camo, which is essentially the same thing (only not). How much would you pay? Expect Activision to answer that question shortly. Update: Activision has dropped the full info, with prices and the Digital Deluxe version for PC. Collectible 2-Sided SteelBook - Limited edition game case featuring exclusive artwork. Official Call of Duty: Black Ops II Soundtrack - A digital copy of composer Jack Wall's epic in-game score with Theme by Trent Reznor. Xbox LIVE CLAW Avatar Prop - An exclusive avatar prop, deployable to a dashboard near you. Xbox LIVE Zombies Avatar Costume - Show off your pride with an avatar costume built exclusively for fans of the Call of Duty undead. Call of Duty: World at War Game Download Token - A digital download of Treyarch's classic title, traversing WWII storylines from the Pacific to European theaters of war.